This recipe is definitely a keeper. 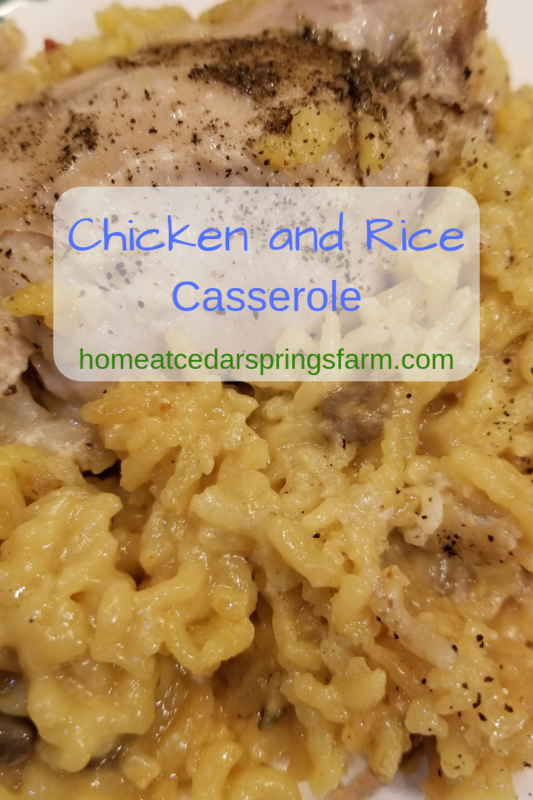 Chicken and Yellow Rice Casserole is big on taste and very satisfying. It’s a comforting dinner that’s simple to make, and pleasing to your taste buds. Chicken, yellow rice, and cream of mushroom soup. Only 3 main ingredients for this one-pot meal! My family loves rice- yellow rice. We would much rather have the yellow than the white. (I guess you could say we are rice snobs) The yellow is so much more flavorful and savory, and if I am cooking a dish that requires rice, I always try to switch the white for the yellow. Like this rice and corn casserole! Last night I needed a quick and easy one-pot meal. I was not in the mood to wash a bunch of pots and pans and spend a lot of time cleaning up after supper, so this was the perfect dish to make. The chicken is tender and juicy, and the rice is loaded with flavor and has a nice creamy sauce. This dish is sure to please your family and have them going back for seconds. I used 2 cans of cream of mushroom soup because we like mushrooms, but feel free to use cream of celery, or cream of chicken, or just whatever you like best. We also like chicken thighs. 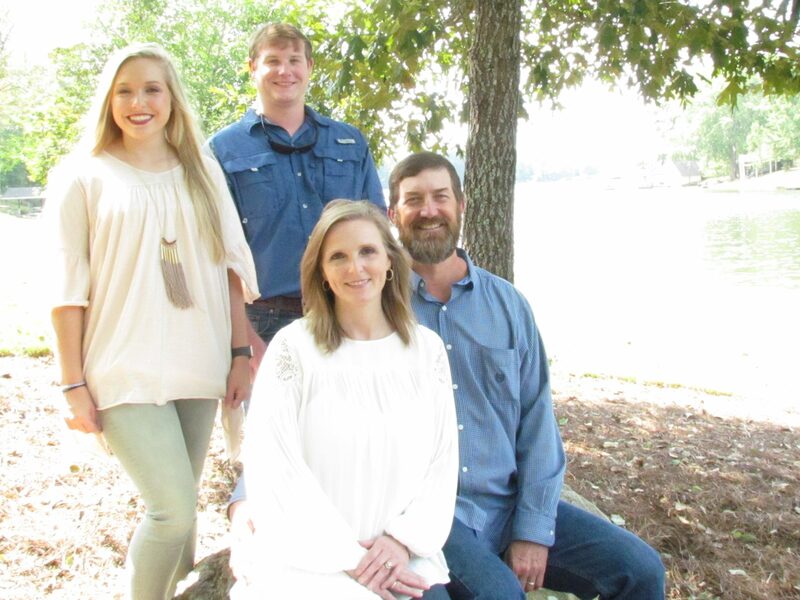 My family prefers dark meat and thighs usually have the best flavor. Again, use whatever chicken pieces you like the best. Now, on to the rice. Yellow rice is the best! I know I have said this before but its true. It is packed full of flavor and spices and just quite delicious. If you are going to cook a meal with rice, it might as well taste good, right? 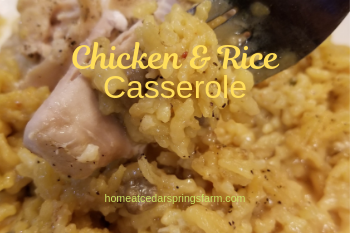 This casserole would be perfect for weeknight dinners, potlucks, church socials, or dinner with friends or just because you love chicken and rice! 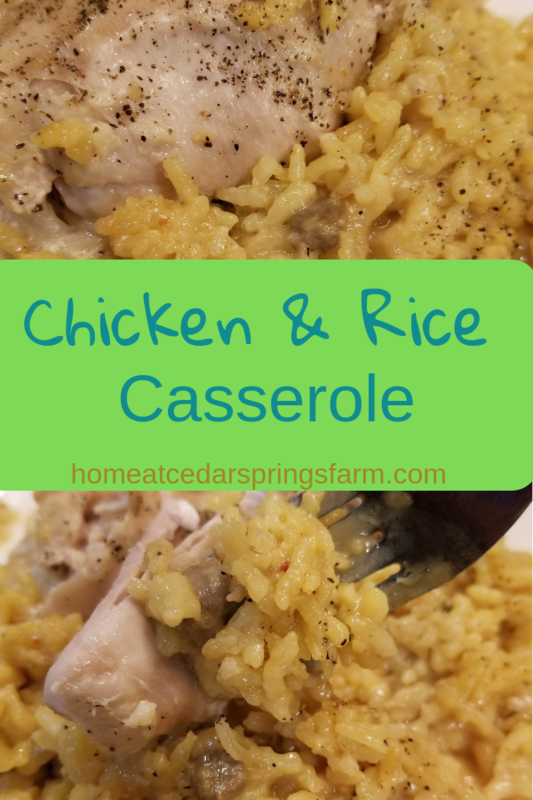 Chicken and Yellow Rice Casserole is big on taste and very satisfying. It's a comforting dinner that's simple to make, and pleasing to your taste buds. 1 family pack chicken thighs I used 8 thighs. In a bowl, mix rice, soup, and water. Pour rice mixture into a 13" x 9" casserole dish. Arrange chicken on top of rice mixture. Cover with foil. Bake at 325 degrees for 1 1/2 hours. If you are using chicken breast, you may need to add an additional 30 minutes to the time.